Jennifer Peterson says she has always been into barbecue and remembers spending hours in the kitchen during her childhood years. She would parlay that love into owning a few different restaurants in the Portland area as well as an eatery in southern Washington across the Columbia River from Hood River. But she recently reached a point in her life when she was ready for a change of scenery and brought her belongings and culinary know-how to Prineville. 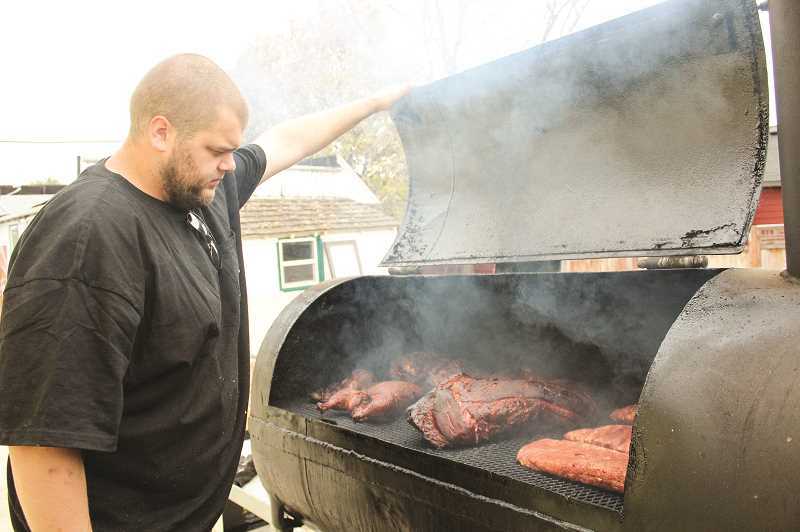 What resulted was Juniper Canyon Barbecue, tucked away in a drive-up locale on North Main Street. "I love Central Oregon," she gushed. "I have family over here." Peterson admits her plans didn't necessarily include a full-blown restaurant when she first decided to head to Crook County. "I wanted to focus on my sauce and my cornbread recipe for retail," she said. "Then things kind of changed around, and I thought, well maybe I should look for an actual location." That was when she found the drive-up building where several eateries have preceded hers. It doesn't offer much in the way of dine-in potential, but Peterson is just fine with that. "This just seemed to be the perfect location to start with," she said. "Eventually, I would like to roll up the garage doors and have an indoor/outdoor area, but right now, it works. For just starting out again, it really does work." The Juniper Canyon menu is heavy on slow-cooked, smoked meats that spend hours in one of two smokers alongside the building. One of the smokers was built by fiancé Kevin Simmons, she boasts. Patrons can choose from different pork, brisket and chicken plates, and sausage, smoked pastrami and bacon cured on site have recently joined the mix. Peterson offers sandwiches on rolls purchased at Prineville-based Granny Faye's Bakery. Sides include fries, beans, coleslaw, white cheddar mac, red potato salad and of course, cornbread. "Everything is house made," Peterson said of her meats and sides. "It is my own rub, my own sauce, the cornbread mix is my own recipe. Everything is scratch-made." She goes on to stress that all of the meats come from local establishments, including St. Helens brisket, Carlton pork and pork bacon and Merryhill's chicken. So far, the most popular menu item is the brisket. "We smoke it for 16 to 18 hours on oak, maple wood mix from the (Willamette) Valley," she said. "It just has such a great flavor to it." Having enjoyed early success, Peterson recently hired a baker, bringing her employee total to nine, and began offering breakfast. "She is doing kolaches, which is a yeast roll with our brisket and cheese, or pulled pork, or our bacon," she said, adding that they can do vegetarian kolaches as well as cinnamon rolls and sweetbreads. To accommodate the breakfast crowd, Peterson changed her opening hour from 11 a.m. to 5 a.m. Monday through Friday and 7 a.m. on Saturday. The restaurant is still open until 7 p.m. all six days of the week, or until sold out. Peterson has determined during her time at Juniper Canyon Barbecue that Prineville is not only a meat and potatoes type of town, but a welcoming and supportive community as well. "Prineville has been amazing," she raved. "Everybody here has been welcoming with open arms. Feedback has been good." In the seasons ahead, Peterson doesn't anticipate any changes in her new restaurant during the cold winter months, but as the temperatures rise in the spring and summer, she would like to explore adding more outdoor tables, and possibly pursuing a beer and wine license. "It would be awesome," she said. Address: 755 N. Main St.